Sushil Modi's son Utkarsh works with a multinational in Bengaluru and is getting married in Patna on December 3. 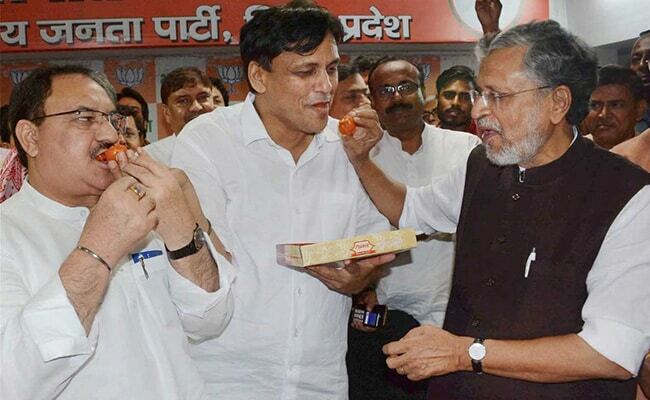 The wedding of Bihar Deputy Chief Minister Sushil Modi's older son, Utkarsh, won't be a grand affair but will send out a message, the BJP leader has announced. A unique invitation is being sent to guests on emails and WhatsApp declaring "no dowry is taken for this marriage". The Deputy Chief Minister of Bihar, a state which is known for its lavish and dowry-oriented marriages, has also requested his guests not to bring any gifts. Mr Modi's son Utkarsh works with a multinational in Bengaluru and he is getting married to a Kolkata girl in Patna on December 3. The wedding will be a simple affair with no music bands and DJ, and the guests will be served simple refreshments not a lavish meal. 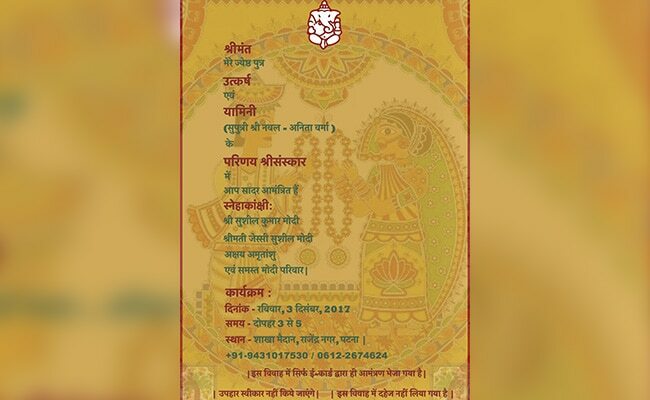 The e-invite for Sushil Modi's son's wedding includes the disclaimer about dowry. The marriage venue is where Mr Modi threw his wedding reception in mid-80s when he was a student leader. Mr Modi, whose marriage to a Christian girl Jesse George created much flutter then, recalled that all top BJP leaders had attended his marriage function. The move is in sync with Bihar Chief Minister Nitish Kumar's campaign to abolish child marriage and dowry. According to official records, Bihar ranks second in the country after neighbouring Uttar Pradesh when it comes to dowry-related cases. 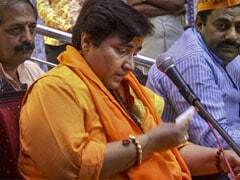 Mr Kumar, who strongly criticises the practice of dowry, had urged people to not attend wedding ceremonies where dowry is taken. "Do not participate in a marriage ceremony where you have come to know that dowry has been taken," Mr Kumar had said addressing a function on the 126th birth anniversary of BR Ambedkar.